Quite frugal. Fairly green. Always Kate. Here are a few things I’ve learned in no particular order. 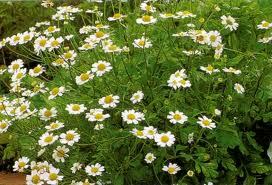 I wish my feverfew looked this good, but it doesn't. Some plants are harder to grow from seed than others.Watermelon, zucchini, green beans–piece of cake. Feverfew, lavender, rosemary, and bell pepper–not so easy. I’ll be buying those plants next time. Don’t over water your garden. I watered the garden too often and almost the whole garden came down with a fungus. I had to spray it with fungicide three or four times in order to save the plants, and I still lost my butternut squash, my little pumpkins, and my cantaloupe. Which leads to my next point. If the leaves are turning yellow and dying, don’t ignore it and think its from the record hot weather. Wilting is from the heat. Yellow and dying leaves are not. Now I know. The fungus started on my butternut squash plant, and by the time I realized there was a problem, it had already spread to my Brandywine tomatoes, my yellow squash, my watermelon, my North Georgia Candy Roaster squash….. You get the idea. Address problems in the garden immediately. My poor butternut squash plant before I had to pull it up. Companion planting doesn’t work. Neither does planting things that supposedly deter bugs, like catnip. I did all of that jazz (planted borage, feverfew, basil by the tomatoes, etc) and it didn’t seem to help one iota, although it made the planning of the garden much more involved than it needed to be. Next time I’m not going to worry about that. Organic gardening doesn’t mean doing nothing. When I started this venture as a brand new gardener concerned about crazy chemicals, I didn’t realize all the stuff organic gardeners still do to protect their crops. Floating row covers, going out and killing bugs by hand, soil amendments to keep the plants healthy, grinding up eggshells to prevent crawling critters and increase calcium content in the soil. I could go on and on. I didn’t know any of this stuff when I started, so I just didn’t do much. I killed some bugs by hand until the plants got so large that it was taking me forever to look over them. By not doing much, I’ve let the bugs get out of control, especially on the tomatoes. I’ve got stink bugs, squash bugs, and leaf footed bugs, among other things. I did spray some Seven out of desperation once, but that didn’t even put a dent in them. I’ve just been living with spotty tomatoes until I figure out what to do. 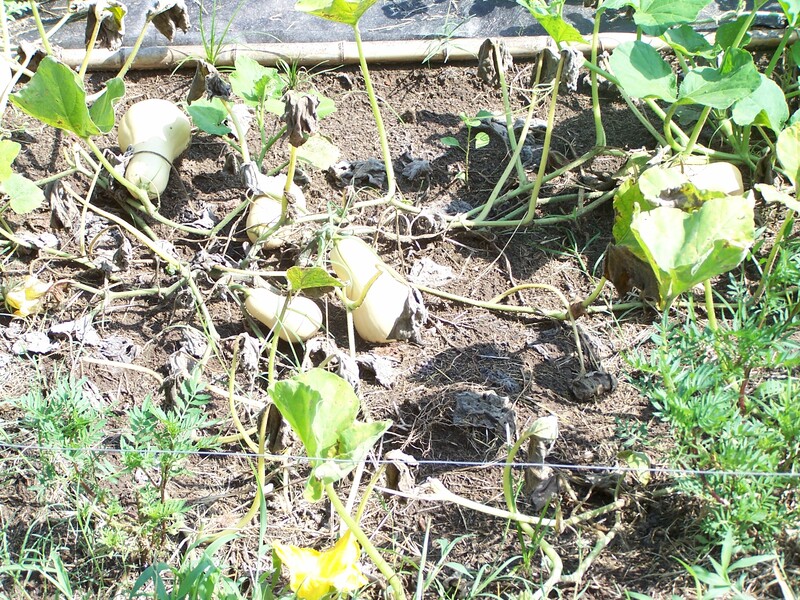 Don’t plant your winter squash too soon (especially if you have a long growing season). I didn’t fully think this through when I planted them in April and instead of my tiny pumpkins being ready for fall and Thanksgiving, they were ready for 4th of July. Nothing says Independence Day like pumpkins, right? Weeds grow like, well, weeds.I had no idea that weeds actually grow so fast. And now I understand on a personal level why people complain about invasive plant species. Bermuda grass is my nemesis. I’ve done a lot of weed pulling over the past few months and I’ve also learned that its much easier to pull tiny weeds than big weeds. Weeding should be done often. Unfortunately, my gardening gloves are not this cute. Gardening gloves are my friends. Gloves make such a difference in the garden. My hands were getting all stained and gnarly looking until I finally started wearing my gardening gloves and, voila, problem solved. Its also better for killing bugs. I don’t like touching bugs with my bare hands, but I will with gardening gloves on. Proper tools make all of the difference. My husband bought me a really nice pair of gardening shears and a hand cultivator for Mother’s Day this year and I have used them constantly. My mother-in-law bought me a rotary cultivator at a yard sale, and I’ve used it a ton too, especially in the beginning. Having the right tools has saved my back and hands a lot of work. Fresh from the garden produce tastes better and makes it all worth it.There is a night and day difference between fresh tomatoes and store bought tomatoes. Same thing with watermelon and herbs. There is just no comparison in flavor. That is one of the reasons that makes all the work of a garden worth it. 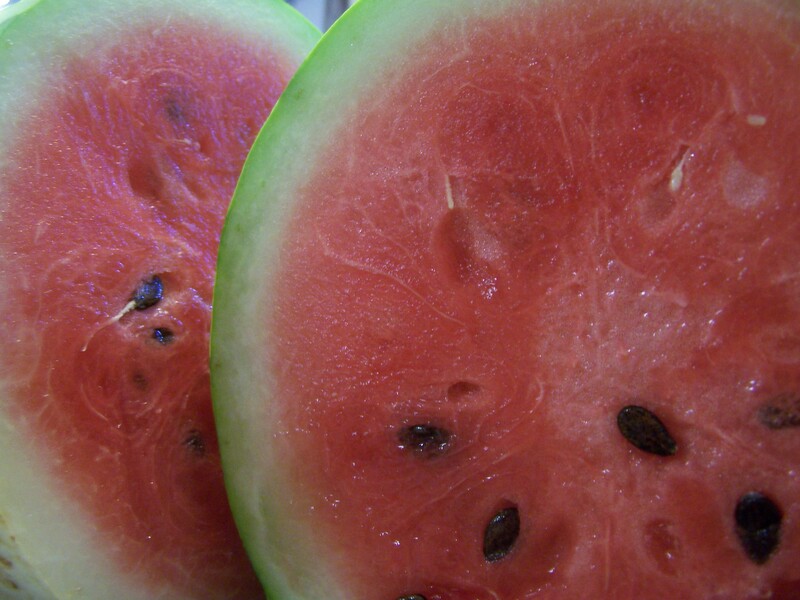 Watermelon fresh from the garden--so sweet and juicy. Tastes like summer. 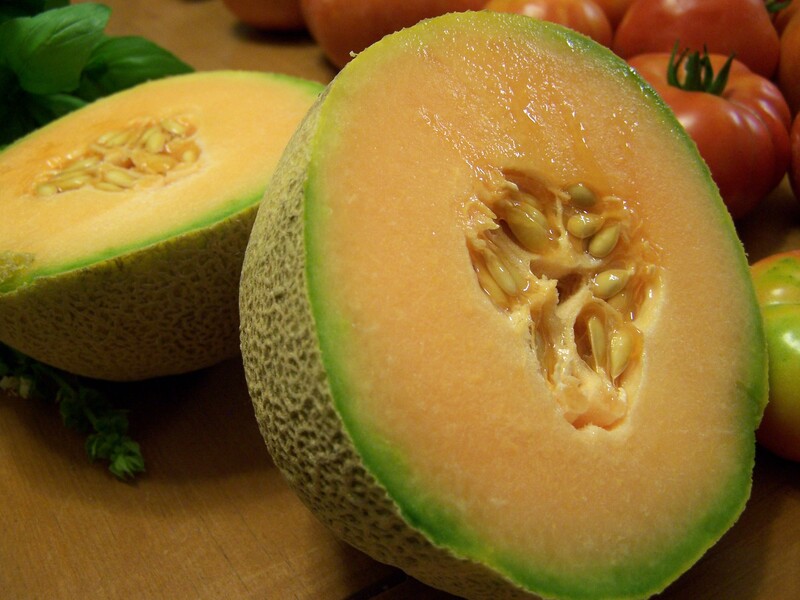 This is some of the best cantaloupe I've had in years. I can't even describe how delicious it is. 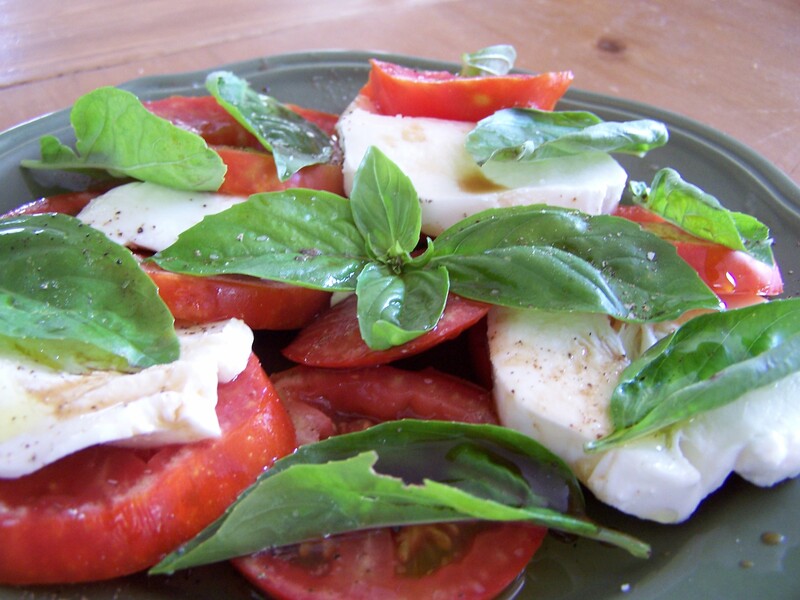 Caprese salad with fresh from the garden tomatoes and basil. Heavenly. That’s all I can think of right now, at least about things that deserve their own bullet point. I’ve learned other random facts such as caterpillars have green blood, that snakes like to live under the foliage of green beans, and that zucchinis can grow a lot in one day. How is everyone else’s garden doing? What have you learned this summer? Anyone want to share any goat or chicken stories with me? I’m looking for a new tag line for my blog! Help me out and join the conversation on Facebook! I’d appreciate it! ← Hello? Anybody still here?? Well, since I consider YOUR garden, MY garden as well (at my house, I usually keep an eye on the kiddos, etc.) I believe it has been a success. My favorite part part has been watching you experience the “experience” of gardening! And the tomatoes are delish! I have loved hearing about your garden this summer. Thanks for sharing! You know I’m living vicariously through you so of course I’m all about the chickens and goats. If you use deep mulch gardening there is almost no weeding, though some bermuda grass still finds a way to come up. There is also no more tilling, and it holds moisture in the soil for longer. My garden is going like crazy. Other than a few tomato horn worms and squash vine borers, I haven’t had too much bug problems. The reason Sevin didn’t do much to help your bug problem is that the bad bugs breed much quicker than the good ones. When you spread sevin you kill them all evenly, but the bad bugs come back much quicker than the good ones. 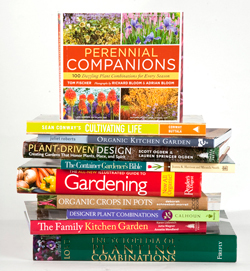 The idea behind companion planting only works in a limited way. A more effective method is to plant mint, lemon balm, bee balm, sweet asylum, etc around your garden to attract, feed, and hold beneficial insects. You can let a few radishes, arugula, mustard, dill, fennel, lettuce, cilantro, mesculin, etc. to go to seed. The flowers will also attract the good bugs and hold more bees in the rest of your garden. Don’t be afraid of planting flowers in the garden they attract good bugs and bees too, and give you fresh cut flowers all summer. Refuse the goats, but get the chickens. Goats are nothing but trouble, while chickens are a joy to own and raise (as long as you don’t get the white cornish cross birds they use in commercial houses). Chickens can provide meat, eggs, entertainment, and bug control. Not to mention they use garden waste and kitchen scraps to make meat and eggs and provide rich manure for the garden in return. A pig is a tastier and easier to take care of farm animal, that will also eat scraps, weeds, and anything the chickens won’t eat (onions and citrus). I don’t know about the others you mentioned, but rosemary and lavender are notorious for taking forever to germinate and have a low germination rate too. These are perennials, so buy them and take care of them and you will never have to buy them again. Be sure to plant them where you want them forever. Fever few is a perennial too so it may take this year to get established and then bloom like crazy next year. For watering look into drip irrigation or soaker hoses, you will have fewer problems and loose less water to evaporation. Sounds to me like your garden was a great success in spite of the problem issues! One tip, plant your tomatoes near the lavendar. The lavendar attracts bees and the bees pollinate the tomatoes. Makes for a huge tomato crop! You’ll probably have to replace your lavendar about once every 5 years but it is well worth it. Great post! I found your blog while searching for info on north Georgia candy roaster squash. My lesson this summer is that squash gets huge! I’m really impressed that this is your first summer and you grew melons! Like David, I was going to chime in that while companion planting may not have the results that you commonly hear, having flowers all around your garden brings in the beneficials and the pollinators–this is something I think is greatly helping with the pest population in my garden. I am trying to not get my hopes up about the squash making it to the curing stage, since it has already come through a squash vine borer attack and who knows what else could happen. There are two growing so far though, so if it does survive I will certainly make some pie, as it seems that was a traditional favorite. I love winter squash in savory dishes so I’ll probably cube and freeze some for Mexican food and maybe some north African stews, and otherwise just puree and freeze soup. It is interesting growing these heirlooms and learning about their history–love Baker Creek seeds! My neighbor always has an awesome garden. She puts cardboard (yes cut up cardboard boxes) in the aisles of her garden. It is so easy to walk through. It keeps the weeds out of the aisles and makes it easy to pick the weeds by the plants. It also keeps is better to keep bugs out. Squash bugs can hide in grass clippings. It has worked so well for her. My zucchini and yellow squash were ruined by bugs this year and I had to uproot them. But thankfully I got some produce before that happened! Your salad looks awesome! thanks for the tips! Oh it sounds like you have done so well with your garden this Summer! Looks like you have had a wonderful harvest. Sign up to hear about new posts by email. Kinda Crunchy Kate is Moving to the Windy City! Dreaming of a Green Christmas Giveaway Winners!